A Steinway piano known as the “Masque de Femme” has just sold at a charity auction for an impressive HK$11.7 million (approx. 1.5 million USD, 1.25 million EUR, 1.12 million GBP). The piano in question is a one-off. 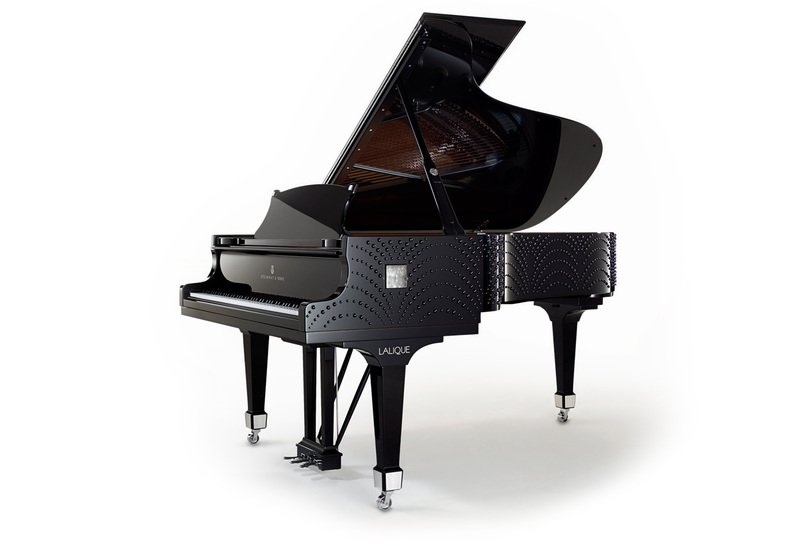 It marks a collaboration between two luxury brands, namely the renowned French crystal maker Lalique and Steinway & Sons. The auction was held at China Guardian’s 5th Anniversary Full Moon charity gala dinner in Hong Kong, with proceeds going to the Ai You Foundation for children suffering heart disease. China Guardian is a major mainland Chinese auction house specialising in the sale of all types of Chinese artworks. René-Jules Lalique trained as a designer of fine jewellery, and in 1887 formed the company that bears his name. He became known for his exquisite glass creations which included perfume bottles, vases, chandeliers, even exclusive car bonnet ornaments. Today the company is recognized for its use of crystal in the production of artistic glass works. 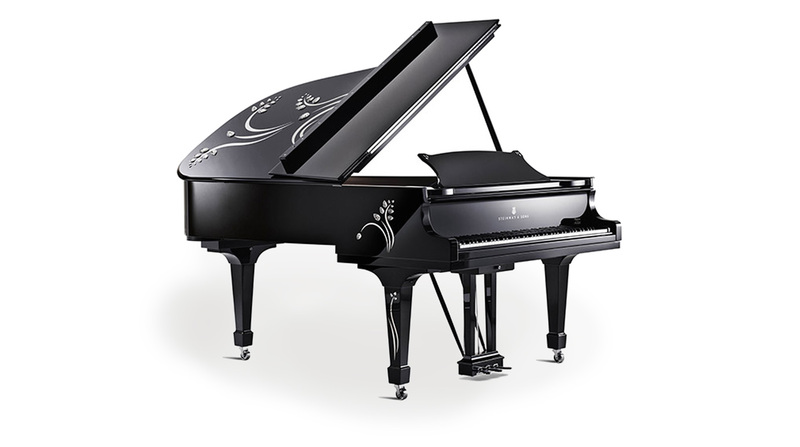 In 2015 Steinway unveiled “Heliconia”, a striking grand piano designed in collaboration with Lalique. Each ‘limited-edition’ instrument features Lalique’s Heliconia flower motif created from 75 meticulously fashioned crystals combined with metal incrustations. The flower appears on the lid legs and case of the piano. The two companies also agreed to produce a very special one-off instrument, that would tour the world before being sold for charity, namely the “Masque de Femme”. The piano is a bespoke Hamburg Steinway Model B grand. At 211 cm this is a mid size piano. This model was chosen for its versatility and all-round appeal. The final instrument took two years to design, and features two iconic visual elements: the actual Masque de Femme; and the Coutard. 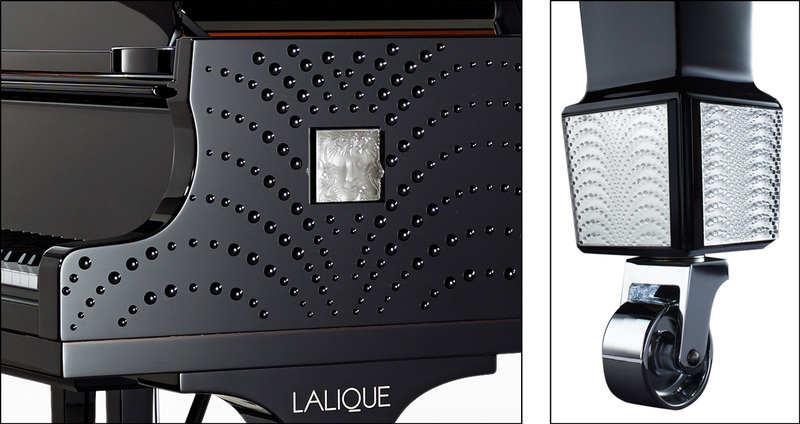 These are both classic Lalique devices that appear in some of the company’s other pieces. René Lalique himself designed both motifs. The Coutard is a geometric representation of the water droplets of a fountain, whilst the Masque de Femme image was apparently inspired by Lalique’s love of both nature and women. It shows the face of the nymph Arethusa surrounded by aquatic life. Greek mythology tells of Arethusa fleeing from her underwater home of Arcadia, and surfacing as a fountain on the Island of Ortygia in Sicily. It all fits! A total of 1,043 individual crystals adorn the piano. These were each worked, shaped, polished, and signed at Lalique’s Alsace facility, and then affixed to the piano at Steinway’s German factory. The process took over 500 hours. It is not, as yet, known who purchased the “Masque de Femme” piano. If it goes on public display at any time in the future I will publish the relevant information.